About us - Benvenuti su poggiodisole! I'm Alessandra, Leonardo's mum, to whom I am passing on all of my love for nature, for the sea and for the beauty of life. I am a Marine Biologist and owner of the “Universo Acqua”, an association which deals with environmental awareness and natural educational activities in Italy and abroad. 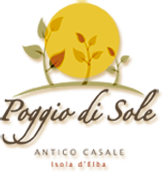 Owner of “Poggio di Sole”, an underwater and scubadiving environmental guide and a guide of the Tuscan Arcipelago National Park.